These ideas reflected those of the political thinker John Locke and they quickly became popular in England. It also sets out – or, in the view of its drafters, restates – certain constitutional requirements of the Crown to seek the consent of the people, as represented in Parliament. In the United Kingdom, the Bill of Rights is further accompanied by Magna Carta, the Petition of Right, the Habeas Corpus Act 1679 and the Parliament Acts 1911 and 1949 as some of the basic documents of the uncodified British constitution. A separate but similar document, the Claim of Right Act 1689, applies in Scotland. The Bill of Rights 1689 was one of the inspirations for the United States Bill of Rights. During the 17th century, there was renewed interest in Magna Carta. The Parliament of England passed the Petition of Right in 1628 which established certain liberties for subjects. The English Civil War (1642–1651) was fought between the King and an oligarchic but elected Parliament, during which the idea of a political party took form with groups debating rights to political representation during the Putney Debates of 1647. Subsequently, the Protectorate (1653–1659) and the English Restoration (1660) restored more autocratic rule although Parliament passed the Habeas Corpus Act in 1679, which strengthened the convention that forbade detention lacking sufficient cause or evidence. Objecting to the policies of King James II of England (James VII of Scotland and James II of Ireland), a group of English Parliamentarians invited the Dutch stadtholder William III of Orange-Nassau (William of Orange) to overthrow the King. William's successful invasion with a Dutch fleet and army led to James fleeing to France. In December 1688, William took over the provisional government by appointment of the peers of the realm, as was the legal right of the latter in circumstances when the King was incapacitated, and summoned an assembly of certain members of parliament. This assembly called for an English Convention Parliament to be elected, which convened on 22 January 1689. The proposal to draw up a statement of rights and liberties and James's violation of them was first made on 29 January 1689 in the House of Commons, with members arguing that the House "cannot answer it to the nation or Prince of Orange till we declare what are the rights invaded" and that William "cannot take it ill if we make conditions to secure ourselves for the future" in order to "do justice to those who sent us hither". On 2 February a committee specially convened reported to the Commons 23 Heads of Grievances, which the Commons approved and added some of their own. However, on 4 February the Commons decided to instruct the committee to differentiate between "such of the general heads, as are introductory of new laws, from those that are declaratory of ancient rights". On 7 February the Commons approved this revised Declaration of Right, and on 8 February instructed the committee to put into a single text the Declaration (with the heads which were "introductory of new laws" removed), the resolution of 28 January and the Lords' proposal for a revised oath of allegiance. It passed the Commons without division. On 13 February the clerk of the House of Lords read the Declaration of Right, and the Marquess of Halifax, in the name of all the estates of the realm, asked William and Mary to accept the throne. William replied for his wife and himself: "We thankfully accept what you have offered us". They then went in procession to the great gate at Whitehall. The Garter King at Arms proclaimed them King and Queen of England, France, and Ireland, whereupon they adjourned to the Chapel Royal, with the Bishop of London preaching the sermon. They were crowned on 11 April, swearing an oath to uphold the laws made by Parliament. The Coronation Oath Act 1688 had provided a new coronation oath, whereby the monarchs were to "solemnly promise and swear to govern the people of this kingdom of England, and the dominions thereunto belonging, according to the statutes in parliament agreed on, and the laws and customs of the same". They were also to maintain the laws of God, the true profession of the Gospel, and the Protestant Reformed faith established by law. This replaced an oath which had deferred more to the monarch. The previous oath required the monarch to rule based on "the laws and customs ... granted by the Kings of England". In a prelude to the Act of Settlement to come twelve years later, the Bill of Rights barred Roman Catholics from the throne of England as "it hath been found by experience that it is inconsistent with the safety and welfare of this Protestant kingdom to be governed by a papist prince"; thus William III and Mary II were named as the successors of James II and that the throne would pass from them first to Mary's heirs, then to her sister, Princess Anne of Denmark and her heirs (and, thereafter, to any heirs of William by a later marriage). The Bill of Rights is commonly dated in legal contexts to 1688. This convention arises from the legal fiction (prior to the passage of the Acts of Parliament (Commencement) Act 1793) that an Act of Parliament came into force on the first day of the session in which it was passed. The Bill was therefore deemed to be effective from 13 February 1689 (New Style), or, under the Old Style calendar in use at the time, 13 February 1688. Under the Short Titles Act 1896, the Bill was given the official short title of "The Bill of Rights", without a calendar year suffix. The Bill of Rights was later supplemented by the Act of Settlement 1701 (which was agreed to by the Parliament of Scotland as part of the Treaty of Union). The Act of Settlement altered the line of succession to the throne laid out in the Bill of Rights. However, both the Bill of Rights and the Claim of Right contributed a great deal to the establishment of the concept of parliamentary sovereignty and the curtailment of the powers of the monarch. Leading, ultimately, to the establishment of constitutional monarchy, while also (along with the penal laws) settling the political and religious turmoil that had convulsed Scotland, England and Ireland in the 17th century. The Bill of Rights (1689) reinforced the Petition of Right (1628) and the Habeas Corpus Act (1679) by codifying certain rights and liberties. Described by William Blackstone as Fundamental Laws of England, the rights expressed in these Acts became associated with the idea of the rights of Englishmen. The Bill of Rights directly influenced the 1776 Virginia Declaration of Rights,[nb 4] which in turn influenced the Declaration of Independence. Although not a comprehensive statement of civil and political liberties, the Bill of Rights stands as one of the landmark documents in the development of civil liberties in the United Kingdom and a model for later, more general, statements of rights; these include the United States Bill of Rights, the French Declaration of the Rights of Man and of the Citizen, the United Nations Universal Declaration of Human Rights and the European Convention on Human Rights. For example, as with the Bill of Rights 1689, the US Constitution prohibits excessive bail and "cruel and unusual punishment". Similarly, "cruel, inhuman or degrading treatment or punishment" is banned under Article 5 of the Universal Declaration of Human Rights and Article 3 of the European Convention on Human Rights. Part of the Bill of Rights remains in statute in the Republic of Ireland. On 21 July 1995 a libel case brought by Neil Hamilton (then a member of parliament) against The Guardian was stopped after Justice May[dubious – discuss] ruled that the Bill of Rights' prohibition on the courts' ability to question parliamentary proceedings would prevent The Guardian from obtaining a fair hearing. Section 13 of the Defamation Act 1996, was subsequently enacted to permit MPs to waive their parliamentary privilege and thus cite their own speeches if relevant to litigation. Following the United Kingdom European Union membership referendum in 2016, the Bill of Rights was cited by the Supreme Court in the Miller case, in which the court ruled that triggering EU exit must first be authorised by an act of Parliament. The ninth article, regarding parliamentary freedom of speech, is actively used in Australia. The article on parliamentary freedom of speech is in active use in Canada. The Bill of Rights was invoked in New Zealand in the 1976 case of Fitzgerald v Muldoon and Others, which centred on the purporting of newly appointed Prime Minister Robert Muldoon that he would advise the Governor-General to abolish a superannuation scheme established by the New Zealand Superannuation Act, 1974, without new legislation. Muldoon felt that the dissolution would be immediate and he would later introduce a bill in parliament to retroactively make the abolition legal. This claim was challenged in court and the Chief Justice declared that Muldoon's actions were illegal as they had violated Article 1 of the Bill of Rights, which provides "that the pretended power of dispensing with laws or the execution of laws by regal authority ... is illegal." all of the Preamble down to "Upon which Letters Elections having been accordingly made"
the seventh paragraph "Subjects’ Arms. That the Subjects which are Protestants may have Arms for their Defence suitable to their Conditions and as allowed by Law." all words from "And they doe Claime Demand and Insist" down to, but not including, section 2, bars Roman Catholics from Crown or Government, succession et cetera. Two special designs of commemorative two pound coins were issued in the United Kingdom in 1989 to celebrate the tercentenary of the Glorious Revolution. One referred to the Bill of Rights and the other to the Claim of Right. Both depict the Royal Cypher of William and Mary and the mace of the House of Commons, one also shows a representation of the St Edward's Crown and the other the Crown of Scotland. All the main principles of the Bill of Rights are still in force today, and the Bill of Rights continues to be cited in legal cases in the UK and in Commonwealth countries. It has a primary place in a wider national historical narrative of documents which established the rights of Parliament and set out universal civil liberties, starting with Magna Carta in 1215. It also has international significance, as it was a model for the US Bill of Rights 1789, and its influence can be seen in other documents which establish rights of human beings, such as the Declaration of the Rights of Man, the United Nations Declaration of Human Rights and the European Convention on Human Rights. As part of the Parliament in the Making programme, the Bill of Rights was on display at the Houses of Parliament in February 2015 and at the British Library from March through September 2015. ^ The Act is cited as "The Bill of Rights" in the United Kingdom, as authorised by section 1 of, and the First Schedule to, the Short Titles Act 1896. Owing to the repeal of those provisions, it is now authorised by section 19(2) of the Interpretation Act 1978. In the Republic of Ireland, it is cited as "The Bill of Rights 1688", as authorised by section 1 of, and the First Schedule to, the Short Titles Act 1896 (as amended by section 5(a) of the Statute Law Revision Act 2007). The short title of this Act was previously "The Bill of Rights". ^ Arguably, this right is subject to continuing derogation in modern times; see, for example, Armed Forces Act and discussion of the same in Military Covenant. That all power of suspending laws, or the execution of laws, by any authority, without consent of the representatives of the people, is injurious to their rights and ought not to be exercised. is borrowed word for word from the Bill of Rights 1689. ^ In Quebec the validity of the Canadian parliament's legislation is under judicial review. Blanchfield, Mike (22 July 2013). "Quebec government to mount legal challenge to new royal succession law". National Post. ^ The United Kingdom consists of four countries and three distinct legal systems: England and Wales, Scotland and Northern Ireland. These jurisdictions have particular legal considerations of their own, arising from differences in English law, Scots law and Northern Ireland law. ^ The key landmark is the Bill of Rights (1689), which established the supremacy of Parliament over the Crown. ... 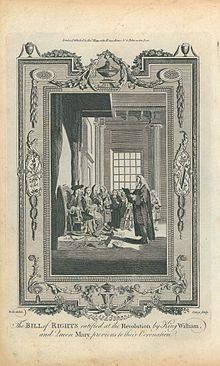 The Bill of Rights (1689) then settled the primacy of Parliament over the monarch’s prerogatives, providing for the regular meeting of Parliament, free elections to the Commons, free speech in parliamentary debates, and some basic human rights, most famously freedom from ‘cruel or unusual punishment’. "Britain's unwritten constitution". British Library. Retrieved 27 November 2015. ^ Schwoerer 1990, pp. 531–548. ^ Maurice Adams; Anne Meuwese; Ernst Hirsch Ballin (2017). Constitutionalism and the Rule of Law: Bridging Idealism and Realism. Cambridge University Press. p. 97. ISBN 9781316883259 – via Google Books. ^ "Magna Carta: Magna Carta in the 17th century". The Society of Antiquaries of London. Retrieved 2017-10-16. ^ Anon. 2010, pp. 2–4. ^ Carpenter 1956, pp. 145–146. ^ a b "The Convention and Bill of Rights". UK Parliament. Retrieved 2 November 2014. ^ Thatcher 1907, pp. 10. ^ "Bill of Rights ". legislation.gov.uk. note X1. Retrieved 14 July 2015. ^ "The Act of Settlement". UK Parliament. Retrieved 8 November 2014. ^ This vigorous assertion of the rights of the subject meant that the Bill of Rights is often seen as parallel in importance with Magna Carta itself. "The Bill of Rights". British Library. Retrieved 27 November 2015. ^ Although the Bill of Rights attacked the abuse of prerogative power rather than prerogative power itself, it had the virtue of enshrining in statute what many regarded as ancient rights and liberties. However, some historians maintain that a more profound change in the relationship between sovereign and Parliament emerged as a result of the financial settlement that Parliament negotiated with William and Mary. "Rise of Parliament". The National Archives. Retrieved 22 August 2010. ^ The earliest, and perhaps greatest, victory for liberalism was achieved in England. The rising commercial class that had supported the Tudor monarchy in the 16th century led the revolutionary battle in the 17th, and succeeded in establishing the supremacy of Parliament and, eventually, of the House of Commons. What emerged as the distinctive feature of modern constitutionalism was not the insistence on the idea that the king is subject to law (although this concept is an essential attribute of all constitutionalism). This notion was already well established in the Middle Ages. What was distinctive was the establishment of effective means of political control whereby the rule of law might be enforced. Modern constitutionalism was born with the political requirement that representative government depended upon the consent of citizen subjects. ... However, as can be seen through provisions in the 1689 Bill of Rights, the English Revolution was fought not just to protect the rights of property (in the narrow sense) but to establish those liberties which liberals believed essential to human dignity and moral worth. The "rights of man" enumerated in the English Bill of Rights gradually were proclaimed beyond the boundaries of England, notably in the American Declaration of Independence of 1776 and in the French Declaration of the Rights of Man in 1789. "Constitutionalism: America & Beyond". Bureau of International Information Programs. U.S. Department of State. Archived from the original on 24 October 2014. Retrieved 30 October 2014. ^ Walker 2009, p. 2: "thereby establishing a constitutional monarchy". ^ Billias 2011, p. 54. ^ Maier 1997, pp. 126–28. ^ a b All the main principles of the Bill of Rights are still in force today, and the Bill of Rights continues to be cited in legal cases in the UK and in Commonwealth countries. It has a primary place in a wider national historical narrative of documents which established the rights of Parliament and set out universal civil liberties, starting with Magna Carta in 1215. It also has international significance, as it was a model for the US Bill of Rights 1789, and its influence can be seen in other documents which establish rights of human beings, such as the Declaration of the Rights of Man, the United Nations Declaration of Human Rights and the European Convention on Human Rights. "2011 UK Memory of the World Register". United Kingdom National Commission for UNESCO. 23 May 2011. Retrieved 4 June 2011. ^ "Facts About the Bill of Rights on Its 220th Anniversary". History.com. 15 December 2011. Archived from the original on 4 October 2013. Retrieved 29 September 2012. ^ a b c d Lock 1989, pp. 540–561. ^ Toporoski, Richard (Summer 1996). "Monarchy Canada: The Invisible Crown". Archived from the original on 17 June 1997. ^ "A Guide to the UK Legal System". Hauser Global Law School Program. New York University School of Law. November 2005. Retrieved 16 March 2016. ^ "The Legal System of the United Kingdom". The Chartered Institute of Legal Executives. Archived from the original on 13 March 2016. Retrieved 16 March 2016. ^ Alexander Horne; Oonagh Gay (21 May 2014). "Ending the Hamilton Affair?". UK Constitutional Law Association Blog. Retrieved 19 March 2015.
the King by his proclamation or other ways cannot change any part of the common law, or statute law, or the customs of the realm"
the King hath no prerogative, but that which the law of the land allows him." Suspending power – That the pretended power of suspending of laws or the execution of laws by regall authority without consent of Parlyament is illegall. Late dispensing power – That the pretended power of dispensing with laws or the execution of laws by regall authoritie as it hath beene assumed and exercised of late is illegall." "Miller & Anor, R (On the Application Of) v The Secretary of State for Exiting the European Union  EWHC 2768 (Admin)". England and Wales High Court (Administrative Court) Decisions. 3 November 2016. Retrieved 4 November 2016. ^ "Brexit court ruling: Your questions answered". BBC. Retrieved 4 November 2016. ^ "The Constitutional Setting". States Services Commission, New Zealand. Archived from the original on 16 October 2008. ^ "Statute Law Revision Act 2007 Section 2". Irish Statute Book. ^ "Statute Law Revision Act 2007 Schedule 1". Irish Statute Book. ^ "Two Pound Coin". The Royal Mint. Retrieved 15 February 2015. ^ "Life, death and everything in between". UK Parliament. 23 May 2011. Retrieved 4 June 2011. ^ "Magna Carta & Parliament Exhibition". UK Parliament. Retrieved 15 February 2015. ^ "Magna Carta: Law, Liberty, Legacy". The British Library. Retrieved 24 January 2015. Anon. (2010). "The Glorious Revolution". Factsheet General Series. G4. House of Commons Information Office. Billias, George Athan (2011). American constitutionalism heard round the world, 1776-1989: A global perspective. New York: New York University Press. ISBN 9780814725177 – via Google Books. Blick, Andrew (2015). "Magna Carta and contemporary constitutional change". History and Policy. Carpenter, Edward (1956). The Protestant Bishop. Being the Life of Henry Compton, 1632–1713. Bishop of London. London: Longmans, Green and Company. OCLC 1919768. Lock, Geoffrey (1989). "The 1689 Bill of Rights". Political Studies. 37 (4): 540–561. doi:10.1111/j.1467-9248.1989.tb00288.x. Maier, Pauline (1997). American Scripture: Making the Declaration of Independence. New York: Knopf. ISBN 978-0-679-45492-2. Schwoerer, Lois G. (1990). "Locke, Lockean Ideas, and the Glorious Revolution". Journal of the History of Ideas. 51 (4): 531–548. JSTOR 2709645. Thatcher, Oliver Joseph, ed. (1907). The library of original sources. University Research Extension. Walker, Aileen; Gay, Oonagh; Maer, Lucinda (2009). "Bill of Rights 1689". House of Commons Library. Text of the Bill of Rights 1689 as in force today (including any amendments) within the United Kingdom, from legislation.gov.uk.